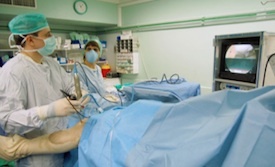 The types of procedures ideal for the ambulatory surgery model are some of the most common and life-enhancing that modern medicine has to offer: arthroscopic joint surgeries, minor gynecological procedures, varicose vein removal, eye and dental surgeries, breast biopsies, proctology procedures, and many others. Thanks to contemporary medicine, minor and elective procedures — things which would have once meant sleeping uneasily on the surgery ward next to someone truly ill, and missing days of work — have become standard, quick, one day affairs. The advantages to the ambulatory surgery model are many: greatly reduced risk of infection in recovery, enhanced safety and comfort of patients who are able to retain greater control over their treatment, and significant resource conservation for the medical establishment. 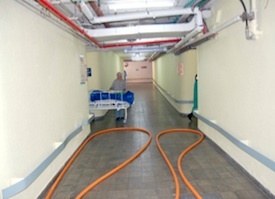 Unfortunately, our Ambulatory Surgery Department is currently located in a basement originally intended as a ward for wartime emergency casualties. 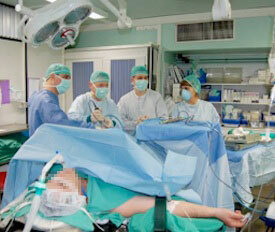 It has three operating rooms and twenty beds for postoperative recovery. Due to a lack of space and resources, all of these beds are in a common area, affording no privacy to patients (including children) in various stages of recovery or to their families. By today’s standards, especially given the fact that 30% of elective surgeries done at Kaplan are performed as day surgeries (double the number since last decade), this is neither acceptable nor adequate. As part of the general effort to bring Kaplan's physical structure up to the extraordinary level of the medicine we practice here, a new Ambulatory Surgery Department is being built on top of our brand new, ground floor ER and adjacent to the site of the planned ICU. The 1,200 square meter unit will include five operating theatres, primary and secondary recovery areas consisting of 25 beds, and administrative and waiting areas. The operating rooms will be equipped with state-of-the-art surgical apparatus, including robotic tools, all integrated within an information management system for maximum efficacy of our medical staff wideband communication systems will allow real time data and imaging retrieval from patient files, as well as the consultation of international databases. Of course, day surgeries will exclude direct contact with the inpatient environment, achieving maximum isolation of these well patients, significantly reducing the risk of post-operative infections and patient depression.